From the foot of the Chyulu Hills all the way down to the Tanzanian border, Tsavo West is a wild and broken land of volcanic hills, black lava flows and dense acacia woodland that makes game viewing harder than on the open plains of the Masai Mara. Nevertheless, all the Big Five can be seen – if you include the black rhinos in their heavily protected sanctuary at Ngulia. Also well worth a visit are the world famous pools of Mzima Springs. There’s a hide where you can watch hippos underwater through its plate glass windows, and the birding is great, too. It’s possible to clock up 500 species in Tsavo, including must-see specials such as golden pipits and vulturine guinea fowl. Kilaguni and Ngulia - two of Kenya’s oldest-established lodges – are situated in the park. Both overlook waterholes where elephant and sometimes leopard come to drink. But for a truly luxurious Out-of-Africa experience you must stay at Finch Hatton’s – a paradise of fever trees and crystal pools alive with hippos, crocodiles and giant kingfishers. The vast and uninhabited plains of Tsavo West is high on my list of favourite Kenyan safari destinations. Wildlife densities are much lower here than the Masai Mara or even Tsavo’s other half away to the east. But the shaggy maned lions of Tsavo – descendants of the legendary man-eaters of Tsavo – are one of East Africa’s more memorable sights and easily seen, while some of my best-ever leopard sightings were in Tsavo West’s Rhino Valley, in the shadow of the dramatic Ngulia Hills. Buffalo and red-hued elephants are also common, while the 90-sq-km Ngulia Rhino Sanctuary, complete with armed guards, has been a huge success in bringing the black rhino back from the brink of extinction – there are around fifty black rhinos in the sanctuary, with another 15 or so having been released into the wider park. In addition to the chance to see all members of the Big Five in a single day, Tsavo West has a lonely, lost-in-Africa feel to it, a feeling you won’t find anywhere else in Kenya. Tsavo is wild, untamed and empty. 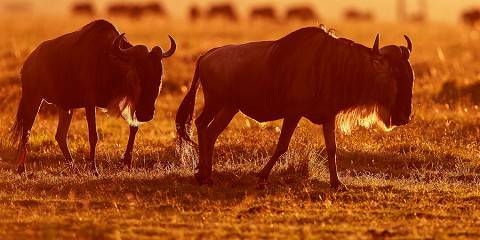 It is by far the largest park in Kenya, covering about 4 percent of the country and is officially split into two separate national parks, Tsavo East and West, divided by the main Nairobi-Mombasa road. 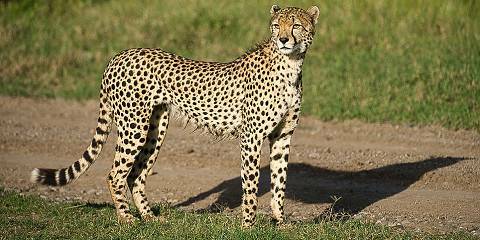 It’s also linked to the Chyulu Hills National Park to the west, Tanzania’s Mkomazi Game Reserve and various private game conservancies spreading the gigantic swathe of protected land still further to the size of a medium-sized country. Tsavo West covers 9,065 sq kms (3,500 sq miles). Tsavo West is far more heavily developed for tourism than Tsavo East. It’s here that you will find most of the luxury lodges, within easy reach of the main road, set on the slopes of the Chyulu Hills. Some, such as the stunning Kilaguni Serena Lodge have superb views across to Mt Kilimanjaro. Both sections of Tsavo have extraordinary wildlife and there are around 500 species of bird in the park but there are also huge amounts of space in which the animals can spread out, so expect to do a lot of driving and keep your eyes peeled. Having said that, with most lodges built around waterholes, some of the best gameviewing can be from your hotel balcony. On my last visit, I was lucky to spot an aardvark a few yards from my room. A rare treat. 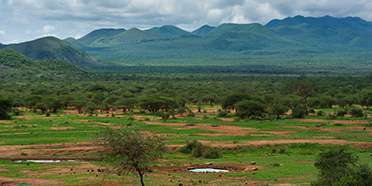 Tsavo West does have vast expanses of the flat dry plains that are so characteristic of the park as a whole, but parts of it are lusher and greener and it has three geographic treats in store. The first, Mzima Springs, is an extraordinary oasis in the sea of hot red dust. One of four natural springs in the park, Mzima is a particularly powerful underground water source that has become the main water supply for Mombasa, but first, its clear pools surrounded by raffia palms and fig trees are a haven for birds and wildlife including hippos and crocodiles. There is an underwater viewing chamber but the wily animals have long since learned to stay at the other end of the pool, leaving tourists to watch the occasional fish. In stark contrast is the jagged black destruction of the 8km (5-mile) long Shaitani lava flow, result of a volcanic eruption in the 19th century, which is just beginning to break up sufficiently for the first plant life to establish. And there is Lake Jipe, which straddles the border to Tanzania, famed for its migrant birds. Tsavo is often ignored. It is one of my favourites. Scenic Tsavo has the space, the game and the facilities to put it very high up among Kenya's parks, and it receives far fewer visitors than the reserves closer to Nairobi. Be aware, however, that if you opt for a day-trip to Tsavo from Mombasa on the coast, you’ll only get to see a fraction of what the park has to offer and will follow a fairly well trodden game drive route. A multi-day safari here is a much better option. I was delighted by the chance to watch hippos and crocs underwater via the glass windows installed underneath Mzima Springs in Tsavo West, but latest reports are that this population has been hard hit by the recent draught and have yet to return to their former numbers. Tsavo West is the more scenic of the parks' two halves with some impressive granite outcrops and a volcanic crater to climb. Tsavo East, though, is even less visited, with some very remote experiences for those that have the cash to enter the mostly closed zone north of the Galana River. Also in Tsavo East is Ithumba Camp, a branch of Daphne Sheldrick's famous elephant orphanage, where you can interact with some of the orphans in the process of being returned to the wild. To the south-west of Tsavo East, and on the opposite side of the Trans-Africa Highway, you find Tsavo West National Park. 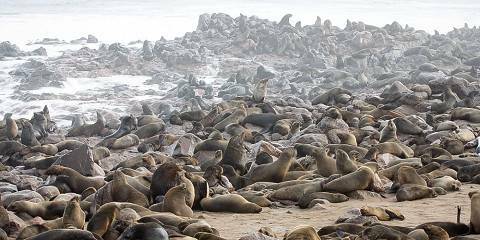 This park is one of the greatest wildlife spectacles that this remarkable country has to offer. Even compared with the spectacular Masai Mara the wildlife density at Lake Jipe (far to the south on the Tanzania border) is astounding. There are great herds of plains game here, immense flocks of waterfowl, massive pods of hippos and vast herds of elephants that can often be seen swimming between the reed islands that lie just offshore from the Kenyan shore. Chyulu Gate campsite in the north of the park makes an ideal first stop and from there a single day’s driving will take you to the Kenya Wildlife Service bandas on Lake Jipe. There are no lodges or hotels in this area though since it is just too remote and there are no convenient airstrips. For the time being one of Kenya’s most beautiful wildlife areas can only be accessed with a sturdy 4wd, several extra jerry-cans of fuel and a fair amount of dedication. Make the sacrifice though and you’ll never regret it. Situated immediately southwest of the Nairobi-Mombasa Highway, Tsavo West is a smaller national park than its eastern namesake, but slightly better for general game viewing. Most people end up in the so-called ‘developed area’ close to Mtito Andei Gate, and this probably hosts the densest wildlife populations, including elephant, giraffe, lion, spotted hyena and the lovely but very skittish lesser kudu. This area also offers access to the 62 sq km Ngulia Rhino Sanctuary, created in 1986 to protect the few black rhinos that survived the intensive poaching of the 1970s. With a rhino density of around one individual per sq km, you’d expect it to be easy to locate these rare creatures here, but in my experience the dense bush makes sightings far from guaranteed. A favourite spot in Tsavo East is Mzima Springs, where fish and sometimes hippo can be seen from an underwater viewing tank. The developed area also hosts several impressive landmarks of recent volcanic origin, notably the Shetani Lava Flow, an area of bare black boulders whose Swahili name means ‘devil’. On a clear day, the views of Kilimanjaro are stunning. A lesser known part of Tsavo West that I have always enjoyed is Lake Jipe, which lies on the border with Tanzania and hosts plenty of hippo, elephant and waterbirds. Thanks to its volcanic character, Tsavo West is hillier than Tsavo East and is dissected by the A23 road between Voi and Taveta. To the north of this road, and also bounded on the east by the Mombasa-Nairobi Highway (A109), is the ‘Developed Area’ where most of the lodges and game-driving tracks are. Here I would highly recommend stopping for a drink, lunch, or stay at Kilaguni Serena Safari Lodge and/or Severin Safari Camp to watch the action at the always busy waterholes; elephant, giraffe, antelope and warthog are permanent residents, and lion are regularly seen. A highlight of my safari was the beautiful Mzima Springs, a sparkling oasis of crystal-clear pools surrounded by date and raffia palms, giant figs and waterberry trees. The water is filtered to aquarium-transparency by porous volcanic ash, and in the submerged observation chamber I watched the blue swirl of large fish – lucky visitors may also see a crocodile swimming by. On my self-drive safari, I also enjoyed the part of Tsavo West south of the A23, especially Lake Jipe which straddles the Tanzania border. It was a wonderfully peaceful area for a bit of hippo- and bird-spotting, there were plenty of elephants around, and marvellous views north to Kilimanjaro in the early evening when the cloud lifted from the summit. Tsavo West – the part of Tsavo which lies between the Mombasa Road and the Tanzanian border – contains one of the busiest and most accessible swathes of safari country in East Africa, visited daily by streams of minibuses from Nairobi, Mombasa and the Indian Ocean beach resorts. The main target, known as the developed area, is a hilly pocket of land in the northern section of the park, dotted with campsites and lodges with good facilities and none of the closed-door stuffiness that can afflict some of the more exclusive places on the safari circuit. The undulating terrain offers some fantastic views and there’s enough vegetation to support huge herds of buffalo, zebras and antelopes; there’s also a reasonably healthy population of lions, known for their unusually short manes (some males have no mane at all). My favourite spot is Mzima Springs, where you can explore the banks of two large pools on foot, watching birds, hippos and crocodiles. It’s hugely popular, so if you’re travelling independently it’s best to get here early, before the crowds descend. Tsavo West is slightly less wild and remote as its sister park Tsavo East. Being close to the coast it gets its fair share of tourists on add-on safaris to a beach holiday. There is a fair number of game around, but don’t expect anything like the more well known parks like Masai Mara or Amboseli. Luckily there are some landmarks to visit here. Worthwhile is a visit to the rhino sanctuary. I haven’t been lucky enough to see a rhino here, but sightings are quite common. In any case, there seems to be a slightly bigger concentration of general game within the sanctuary than outside. Not to miss is the underwater viewing chamber at Mzima Springs. If you’re lucky you’ll be able to look a swimming hippo in the eyes. The springs itself are a beautiful oasis with yellow fever trees. Blue monkeys seem to love this place. Shetani lava flow is another spot to visit: this arid moon landscape doesn’t look like much in the middle of the day, but glows in the late afternoon light. Wildlife wise, the park is good for elephants and giraffes and you might be lucky to see a lesser kudu.